“Courage in Motion”, the annual bike ride in which dozens of IDF Disabled Veterans take part alongside riders from North America, was successfully launched this past Sunday for the eight consecutive year. 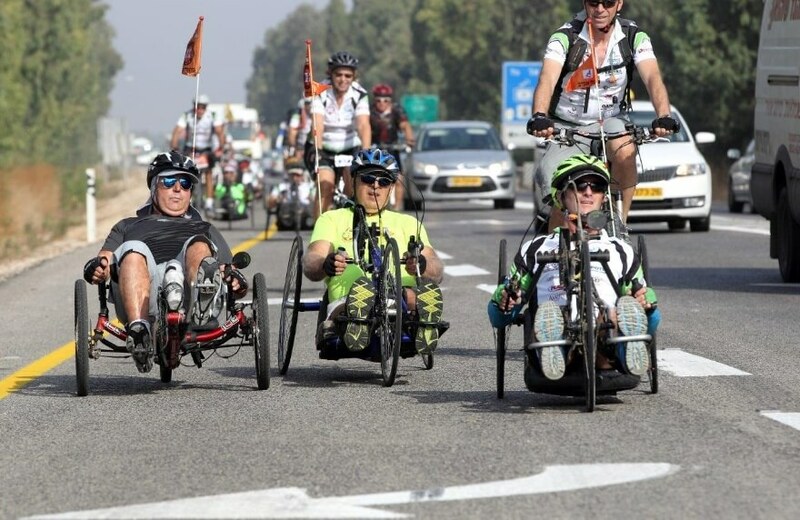 In an initiative of Friends of Beit Halochem Canada together with the Zahal Disabled Veterans Organization (ZDV) the event brings 60 cyclists from Canada and the USA who spend 5 days riding alongside 70 disabled veterans of the IDF, members of the Beit Halochem riding clubs. They cycle throughout the north of Israel on single bikes, hand bikes and tandem bikes. The ride began as scheduled despite concern that some of the guests due to arrive from across the globe would prefer to cancel in light of the precarious security situation in Israel. In fact some of the guests had approached Lisa Levy, Exec. Director of Beit Halochem Canada sharing their fears and telling of the kind of notices they had been exposed to on the social media calling on terrorists to run over Jews in return for money. Levy encouraged the group to make the trip and at the Zahal Disabled Veterans Organization it was decided to add armed security guards to accompany each of the 4 routes of the bike ride. At the very last minute word came through from Canada that all those who had registered from both Canada and the USA were indeed coming without a single cancellation. ZDVO Director General Birg. Gen. (res.) Haim Ronen said: “The arrival of the overseas riding delegation during these difficult times is moving. It is a true testament of the very strong bond of support and commitment that exists between them and our members”. The riders will be riding throughout the North of Israel, including the Golan Heights, the Upper and Western Galilee. All overseas riders’ participation fees are a donation to the ZDVO and its Beit Halochem Centers.